A couple of weeks back someone at lunch asked me if I had been to Helsingør yet to visit Kronborg Castle. I answered that I’d been past it on at least three or four occasions as my train or car has driven on (or off) a ferry to cross to (or from) Sweden (yes, trains actually drive onto ferries here! ), but that I had never been inside. 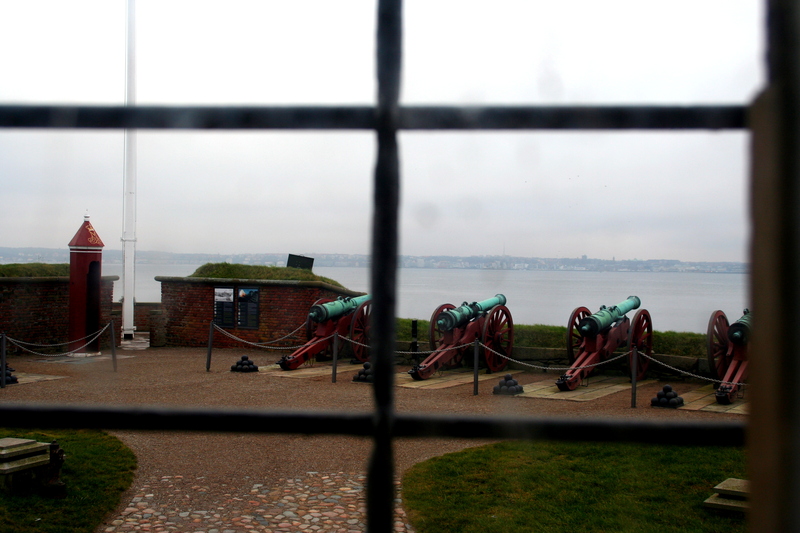 My memories of Krongborg Castle include looking out a fogged-up train window through rain and gloom, and making note of the castle’s immense fortifications. The place is foreboding and seems an appropriate setting for the dark intrigue that Shakespeare penned in his “Hamlet”. 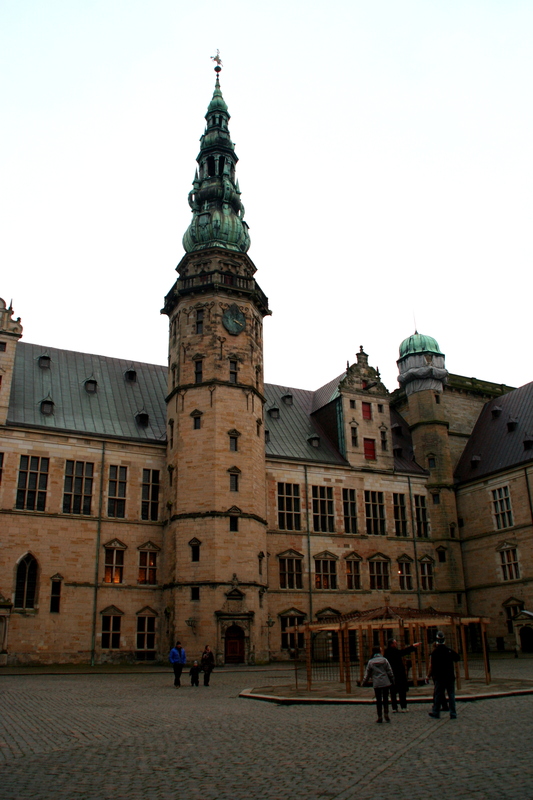 I have always associated Kronborg with deceit and murder and wasn’t sure I needed to see the interior. After speaking with a couple of folks and learning that Kronborg Castle is a UNESCO world heritage site, however, I decided to go check it out. Time is passing quickly here — I have been at Svaholm nearly six months already — and I figured it was time to head out on another adventure. I calculated that I could get to Helsingør and back in a day and wouldn’t need to spend the night. The Danish website rejseplanen.dk gave me the transit info I needed: 4 buses and a train to get there, two trains and two buses to get back, about 2-1/2 to three hours each way. Leaving Svanholm at 9am would give me time to look around on my own a bit before the 1pm guided tour and leaving Kronborg around 4pm when it closed would get me back comfortably before it got too late. Hamlet is a fictional character, of course, although one based upon events that took place a thousand years prior to Shakespeare’s version and hundreds of miles away in northern Jutland. Shakespeare updated the story of Amled to make it more appealing to contemporary audiences and picked a setting that had an international reputation for splendor. 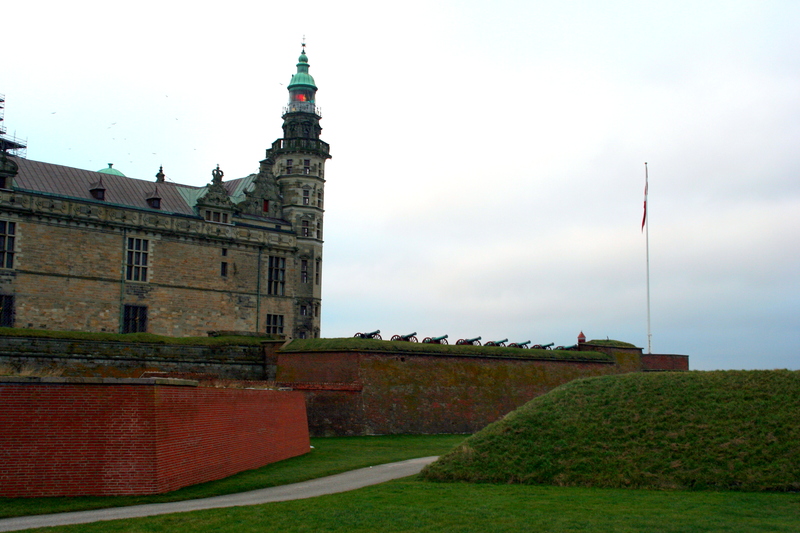 As you can see from the model in the photo below, Kronborg is a castle and star fortress, with multiple lines of defense. 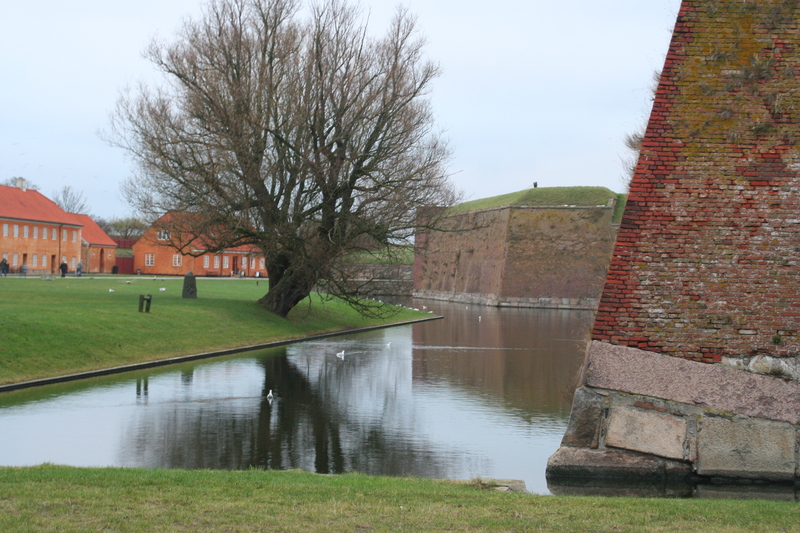 The castle/fortress is located at the narrowest part of the Øresund, the sound between Denmark and Sweden that connects the North and Baltic Seas. 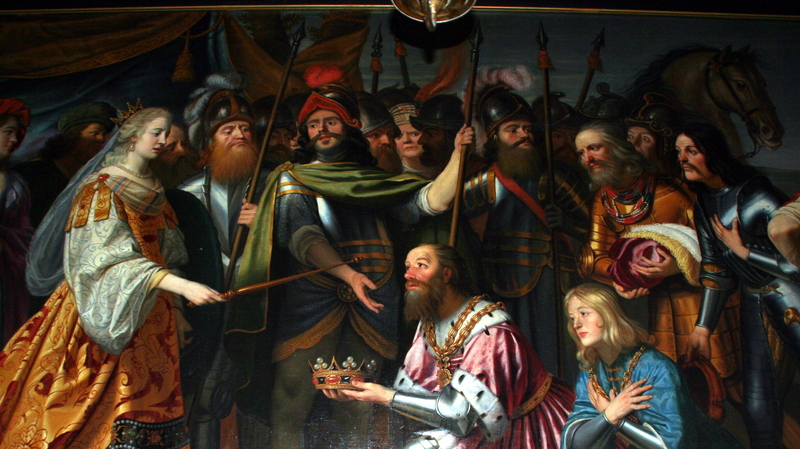 Danish kings collected “Sound Dues” from the ships that passed by in payment for keeping the seaways free of pirates. Down below the ramparts are the casemates, which in times of war could house up to 1,000 soldiers, along with horses and supplies. 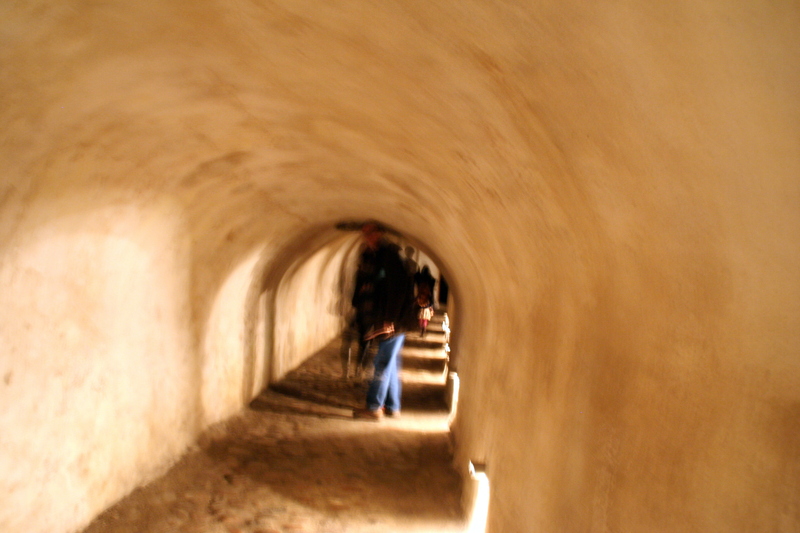 It was too dark down there to take photos, but perhaps this one taken on the way down will give you a sense of the robustness of the fortifications. 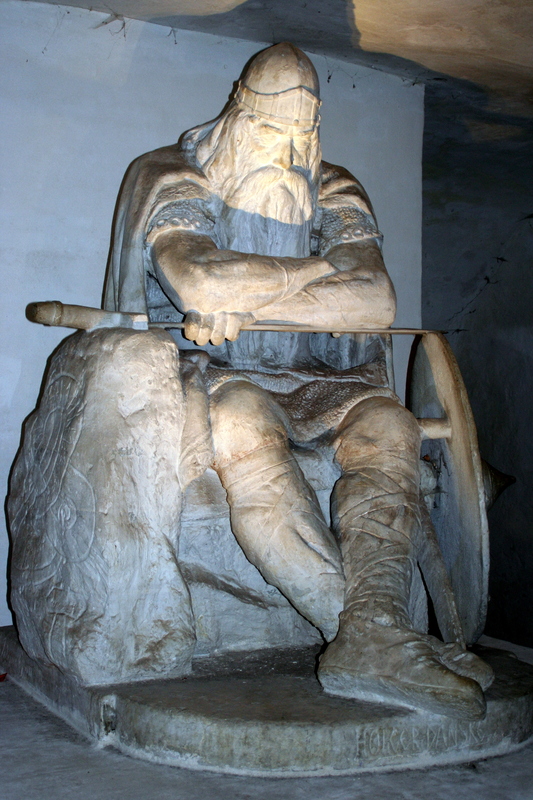 Down in the casemates is a statue of another Danish hero, Holger Danske (Holger the Dane). According to legend, Holger spent time abroad helping to keep the muslims from overrunning Europe. Upon his return, he fell asleep, but if Denmark is ever threatened, legend has it he will wake up to protect it. The castle itself has many levels. The basement was used primarily for storage. The ground floor housed the chapel, the kitchen, a brewery, a blacksmith, shops, and some primitive apartments for commoners. The royal apartments (living/sleeping chambers) were on the next level up and on the top floor were the public areas, e.g., the ballroom. The first part of the castle was built by Eric of Pomerania around 1425. In 1574-85 King Frederik II rebuilt the castle, improving the fortifications and turning it into one of the most significant Renaissance castles in Northern Europe. 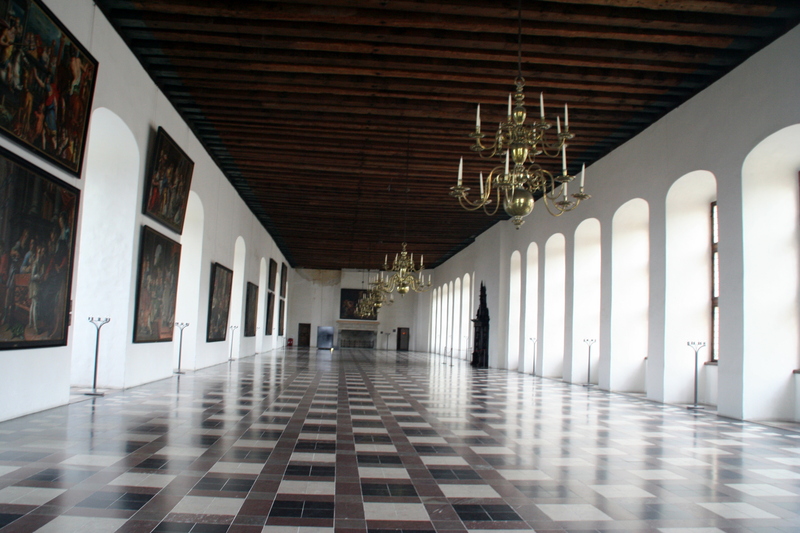 Much of the castle was damaged by a large fire in 1629, but King Christian IV, the son of Frederik II, reconstructed the exterior in a similar style. 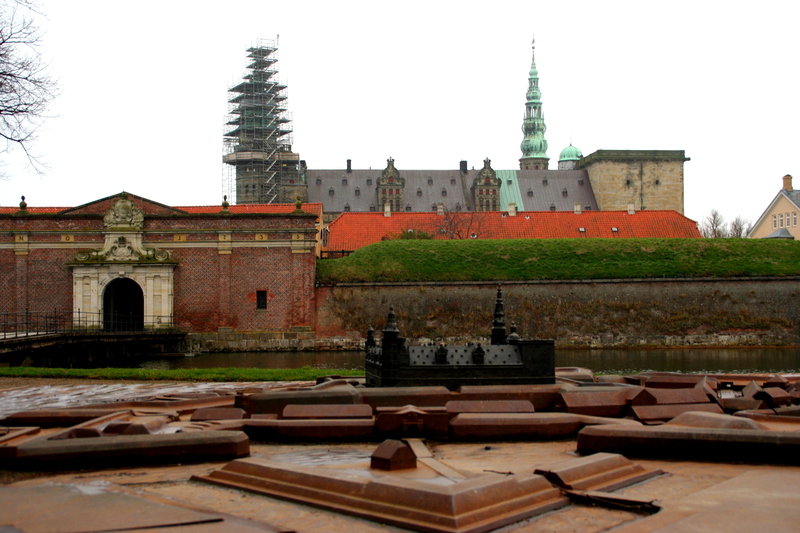 The Swedes bombarded and captured Kronborg in 1658, making off with many of the castle’s works of art, including a magnificent fountain made of brass, which was melted down and reused. In the fountain’s place in the castle courtyard is a small well that was erected in 1934. I found it interesting that one of the castle towers functions as a lighthouse. Back to the inside. The photo below is of the ballroom — Northern Europe’s largest at 203′ X 39′ (62 X 12 meters). The floor is marble and in its day, the walls would have been covered in tapestries, not paintings. I did like this one painting, however. In it you see Margrete I, Queen of Denmark, Norway and Sweden and founder of the Kalmar Union, which united the Scandinavian countries for over a century. Margrete acted as queen regnant of Denmark, although in those days it was not the Danish custom for a woman to reign. She became Queen of Norway and Sweden by virtue of her marriage to King Haakon VI of Norway. Denmark’s current queen is Margrete II, the first female monarch since Margrete I’s death in 1412. 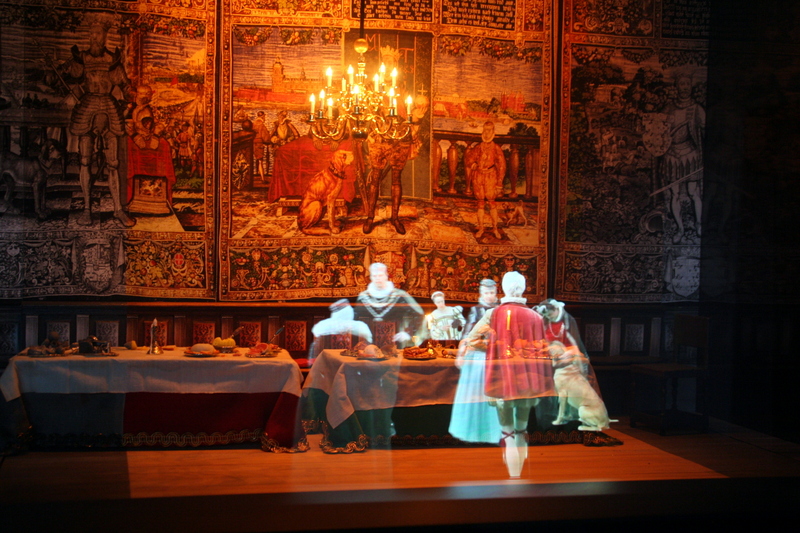 In the ballroom is this miniature display, complete with dancing holograms, that depicts what the room may have looked like in its hey day. 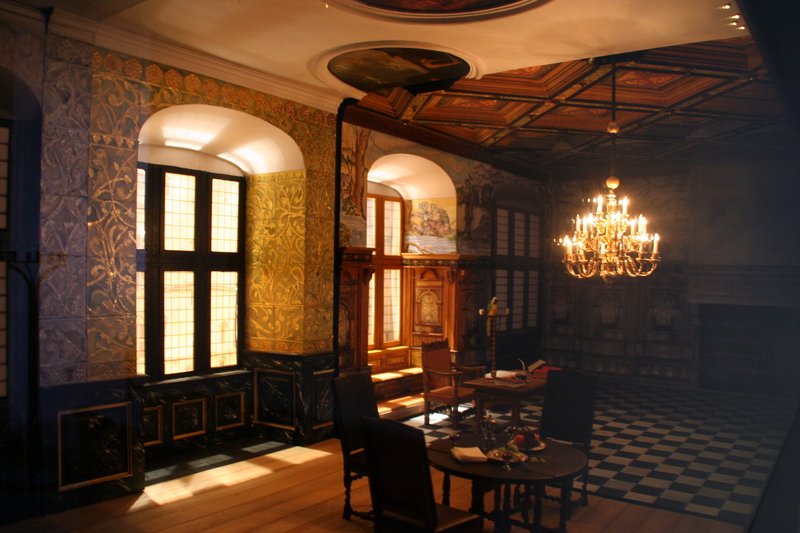 In a different room another miniature display shows how the castle’s interior decor was changed by Christian IV after the fire of 1629. 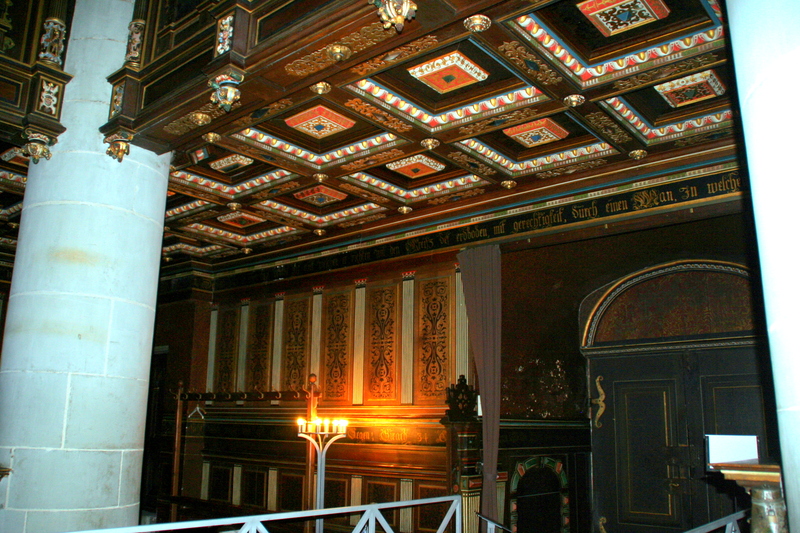 The marble floor tiles were replaced with wood and the wood ceiling was replaced with plaster and inlaid paintings. 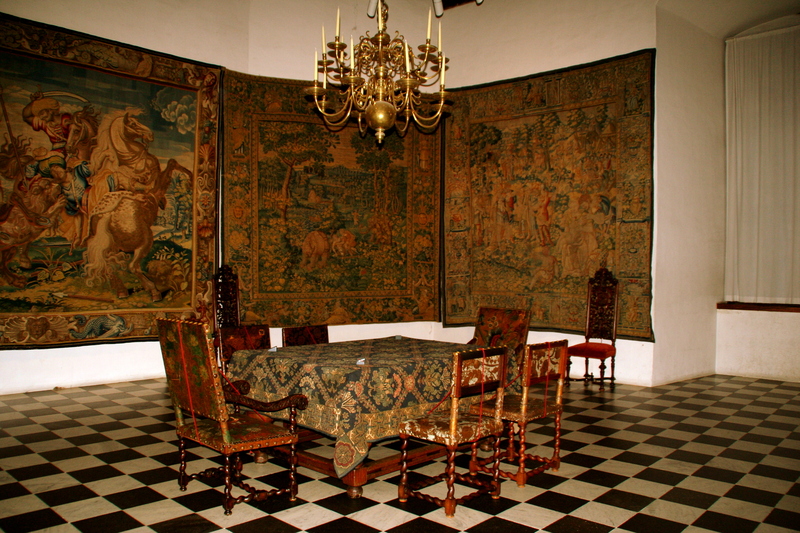 Here’s one of seven tapestries that remain in the castle from a series of 40 that were commissioned by Frederik II around 1580. 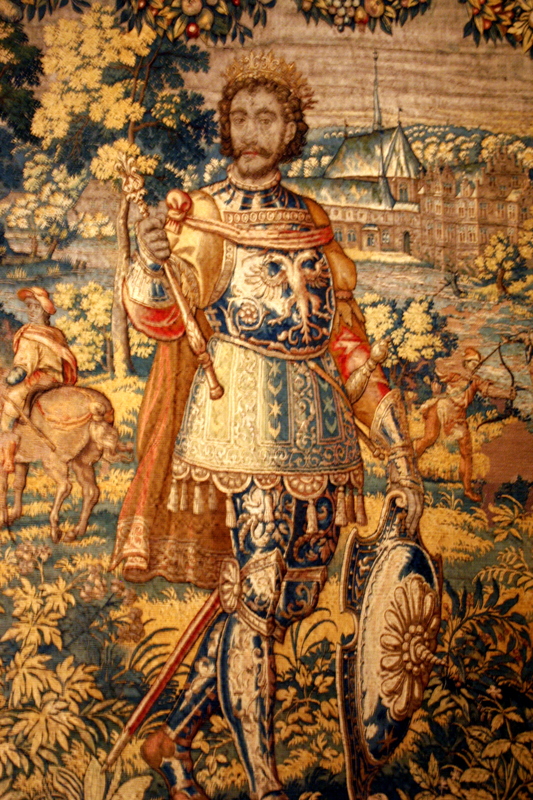 They included portraits of 100 Danish kings and were woven by teams of artisans over about five years. Seven other tapestries from the series are on display at the National Museum of Denmark in Copenhagen; the rest have sadly been lost. In this room you can see the original marble floor tiles and the way the tapestries were meant to be hung, right next to each other in order to cover cold walls. Another interesting tidbit: the tapestries were originally hung 18 inches (50 centimeters) from the walls to avoid damaging them by contact with damp surfaces. Ever wonder how Polonius thought he could hide unnoticed behind a tapestry in Gertrude’s chamber? Eighteen inches provided room! 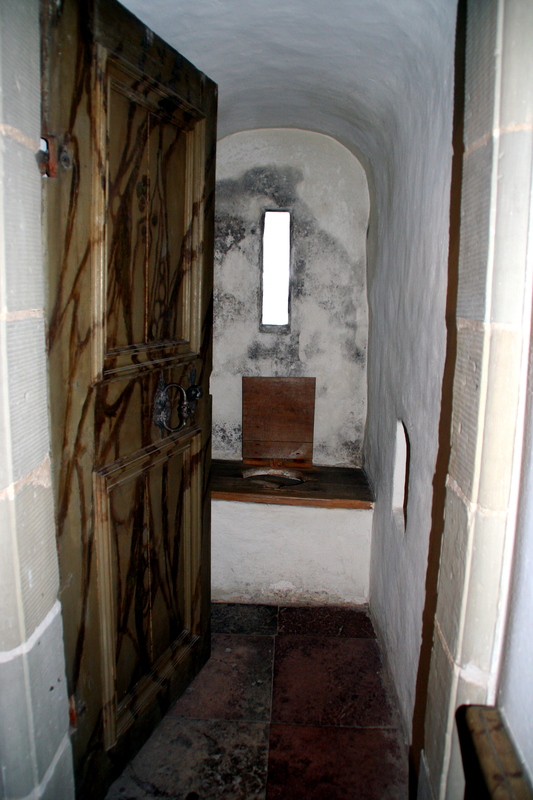 Kronborg had all the modern conveniences, too, like toilets. The tour guide said that in other castles, people relieved themselves in dark corners. Yuk! There were intriguing views out of every window. 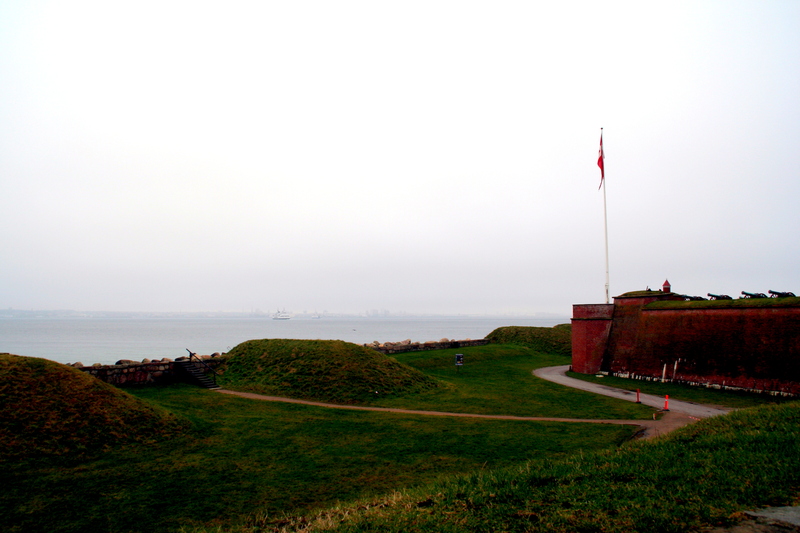 Here you can see the Flag Bastion, where the ghost of Hamlet’s father was to have roamed. Shakespeare appears to have been very familiar with Kronborg Castle, although there is no record of him having been there. The records do show that several of his acting friends performed there, however. 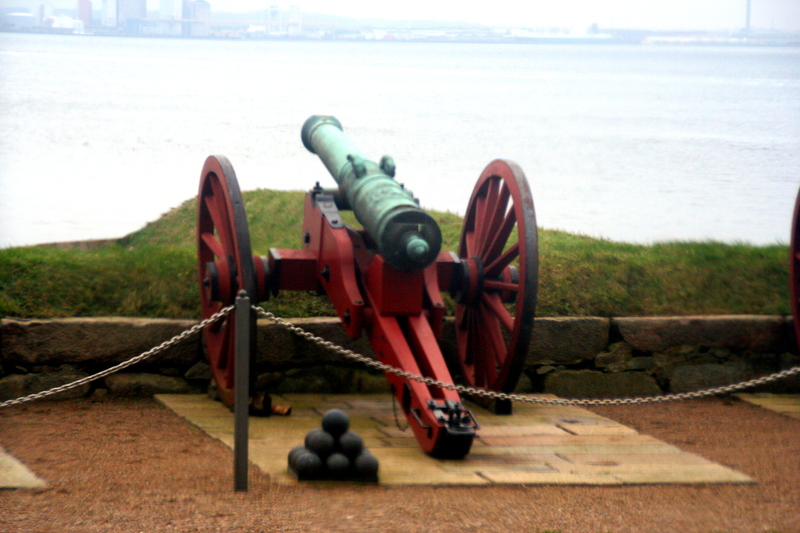 I believe the tour guide said the cannons are the world’s? Europe’s? oldest that are still functional. They were made in Frederiksværk during the 1760s and are still used to mark special occasions in the royal family, like birthdays, and when the royal yacht passes by. 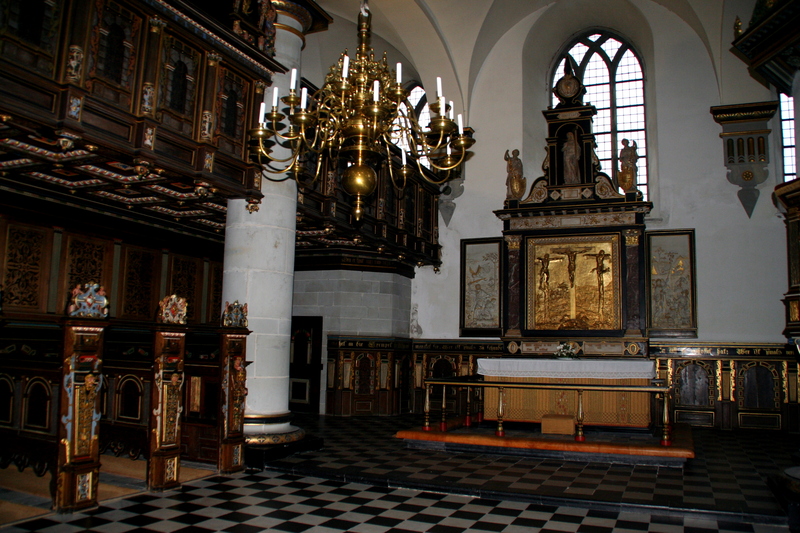 The chapel is the one part of the castle that survived the big fire of 1629. Its beautifully carved and colorful interior gives an idea of Kronberg’s splendor before the fire and Christian IV’s updating. 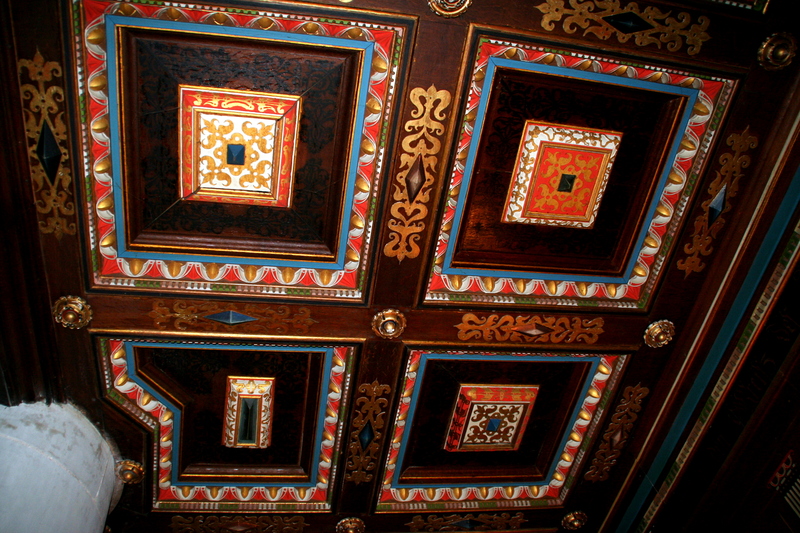 It’s a pity all those wood ceilings in the rest of the castle were replaced with plaster ones. Leaving the castle, I walked out to the water and looked back. 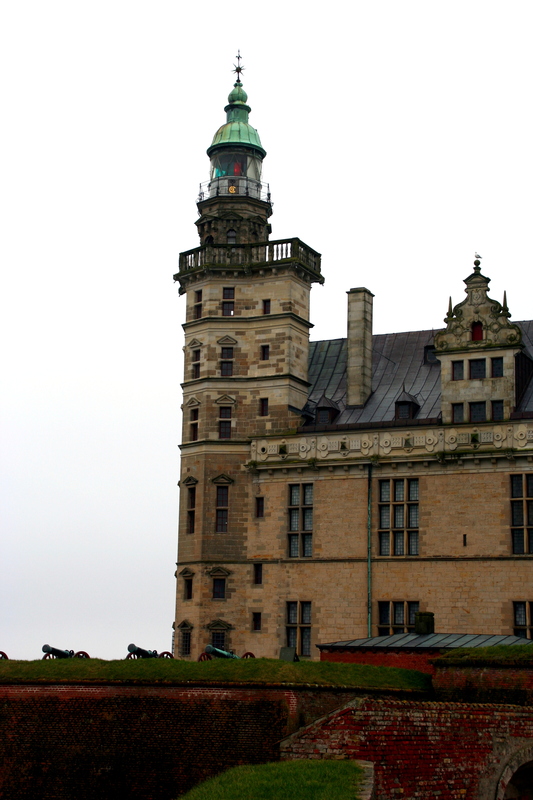 In the photo below you can see the lighthouse tower and four of Kronborg’s five lines of defense. I imagined the ghost of King Hamlet walking on the Flag Bastion, bemoaning his murder at the hands of his brother and demanding that his son seek revenge. The moat is the fifth line of defense. 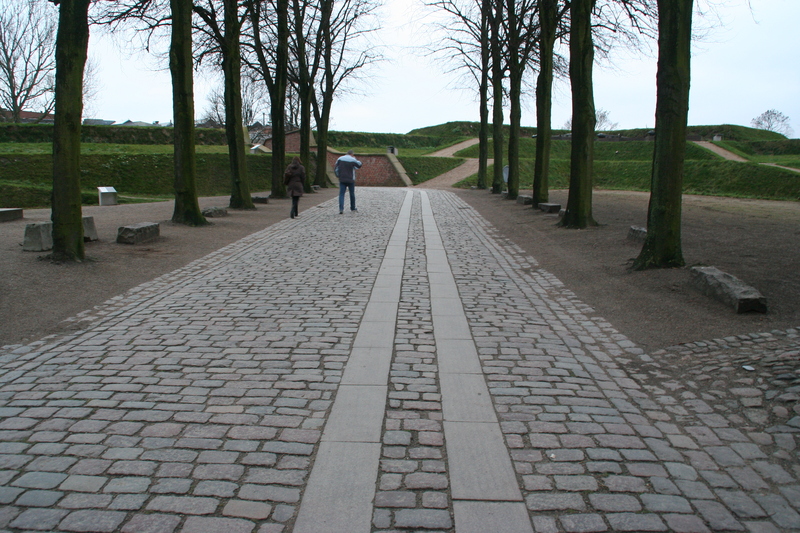 As I left the grounds, I noticed how the cobblestones have been modified to make it easier for visitors with baby strollers or walkers. This is some updating that I approve of. On my way back to the train station, I passed by this charming entry. If you look closely on the left you can see it dates to 1647. While it was only 4pm, it was already getting dark as you can clearly see. On the ride back to Svanholm, I thought about kings exacting gold for safe passage and fighting for control of waterways. I thought about more and more fortifications being added to Kronborg over the years, as the “impregnable” fortress was breached. I thought about how the physical comfort I have in my room at Svanholm is far superior to that of even so lavish a palace as the one I had just visited. I’m glad to be living in 2012 and not 1512, 1612 or even 1812. I was reminded of a question another guest asked me earlier this summer. “What was your best year?” he queried. I couldn’t answer him at the moment, I’ve had so many good years. I needed some time to answer a question like that. The answer came to me on my run the following morning and I was able to give him a reply at lunch: “This year is my best year.” In fact, every year is my best year, with the one exception of the year Mark died. I strive to live in the present and enjoy each moment as it unfolds. 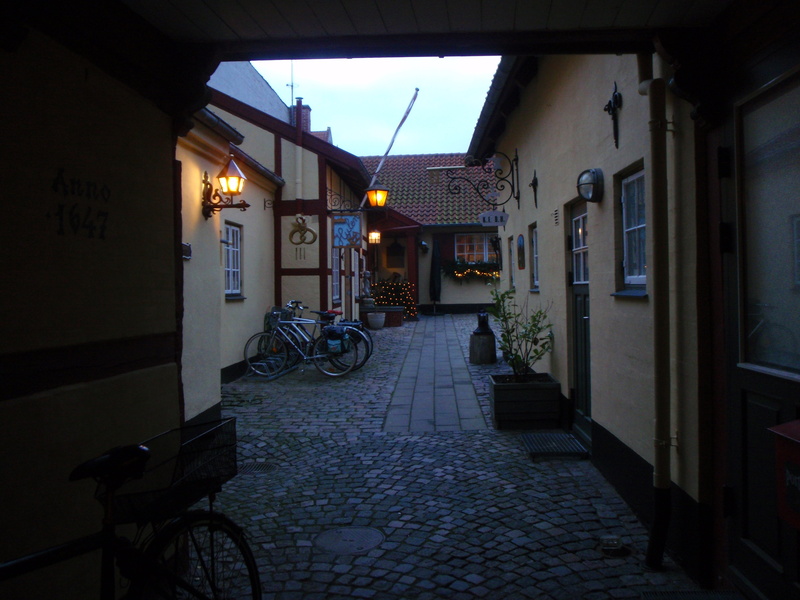 I enjoyed my outing to Helsingør. I hope you have, too. Wow! Your writing made it seem like I was right there! So glad for your adventuresome spirit! This was so delightful! I agree with you — this year is your best. After being with you in Oslo, it’s easy to see that you are happy, curious, and content. And rarely, if ever, complain!! Katy, you’re such a good tour guide. Thank you for sharing your journey with those of us who are uncontinental. Fascinating, Katy–you really put me there in your writing, and the photos are terrific. Fun to see Katy! The bard has nothing on you now. What a neat excursion! Thanks for sharing all of the pictures. I never knew that Hamlet was inspired by real events and a real place. You make a great point – your living quarters look much comfier than the palace! For all the luxury, they still didn’t have real toilets – ewww!